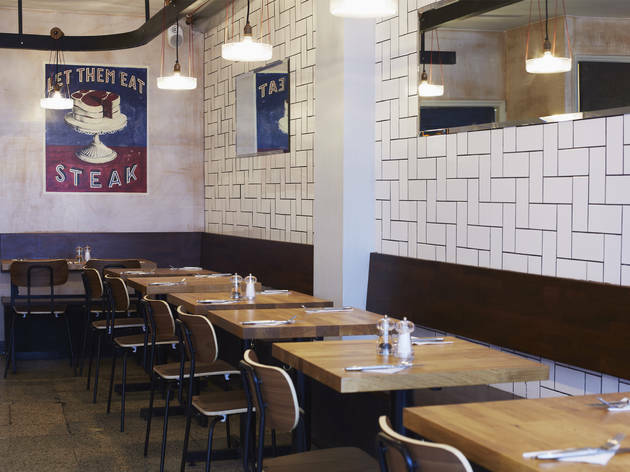 A Kentish Town restaurant, from a chef who trained under Angela Hartnett, specialising in low-price cuts of steak. 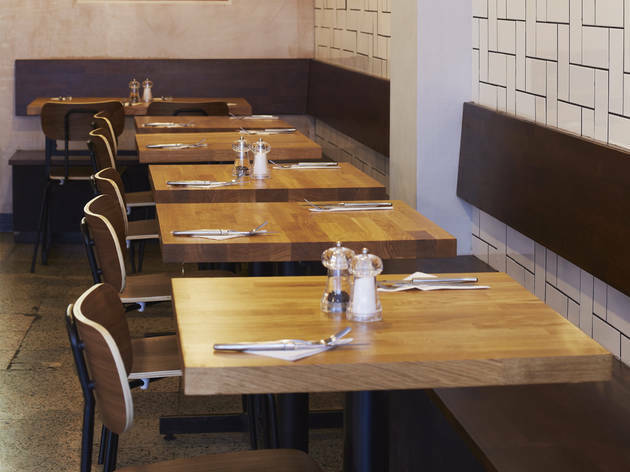 Kentish Town has seen so many bar and restaurant openings in the last couple of years, you’d think the local appetite for new eating-out opportunities was surely reaching satiety. And you’d be dead wrong. 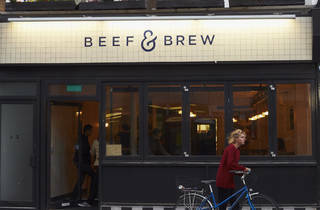 Beef and Brew, which opened late in September, has been doing a healthy-to-roaring trade most nights of the week. The name is going to make you think this is a steak/burger and beer place. It is… and it isn’t. 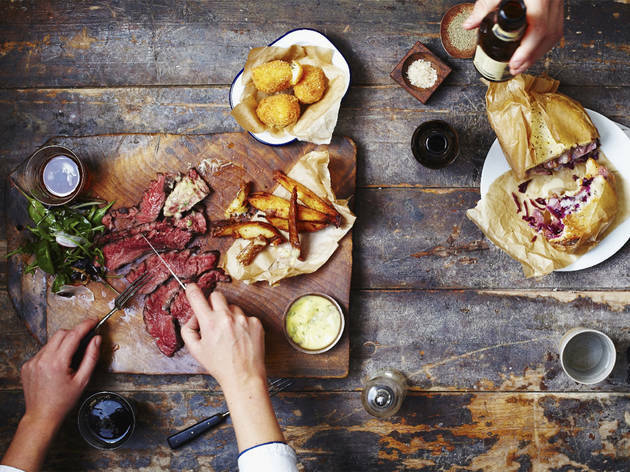 Steak does feature, but this isn’t just another place where dude-food fans can feed their lust for flesh, carbs and alcohol. The chef formerly worked at Café Murano, and there’s a spirit of experimentation here that goes well beyond the quest for figuring out how many high-calorie ingredients you can squeeze into a brioche bun. When we visited, the cooking was best at its simplest. 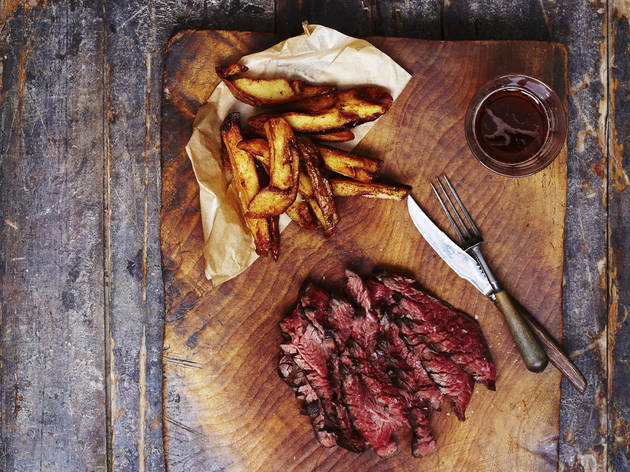 There are just two cuts of steak, both of the cheaper variety: hanger and flat iron. Our flat iron was chewier than this cut needs to be, and not hot enough, but it was a fine piece of beef at a fine price (£12.50). Better still were the chips, volcanically hot and deeply crunchy – the best I’ve had in London this year. Experimentalism didn’t pay off so well. Salt beef brisket (£12.50) was pulled rather than sliced, and long, chewy strings did not suit this already stringy cut. Served on a bed of charred but undercooked leeks, it also featured a mustard sauce that didn’t taste much of mustard. Polenta chunks with parmesan and rosemary were a leathery, boring mistake: avoid. The woody stems on charred broccoli, left unpeeled, were fibrous and way undercooked. Despite these fails, B&B is well worth patronising. 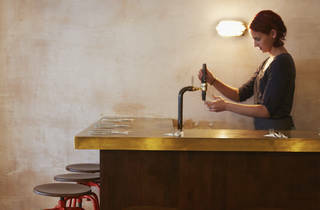 The beer list is short and sweet: two on draft and two in bottle, from the likes of Fourpure and Beavertown (and the house brew is from Harviestoun). Wines price-peak at £27.50. The house negroni (£7.50) is well made. I do wish they’d made an effort to damp down the room’s brutal acoustics, a hangover from the long-standing Sardinian restaurant Pane e Vino that preceded B&B. That’s the only structural complaint. Fixing the faults with the food will be easy for this clearly capable chef. Early success points to ongoing success, even in an area that ought to be shouting ‘please, no more!’ when another new restaurant opens. Superb food and quality drinks (keenly priced to be fair) served in an unpretentious and relaxed environment - what's not to like! 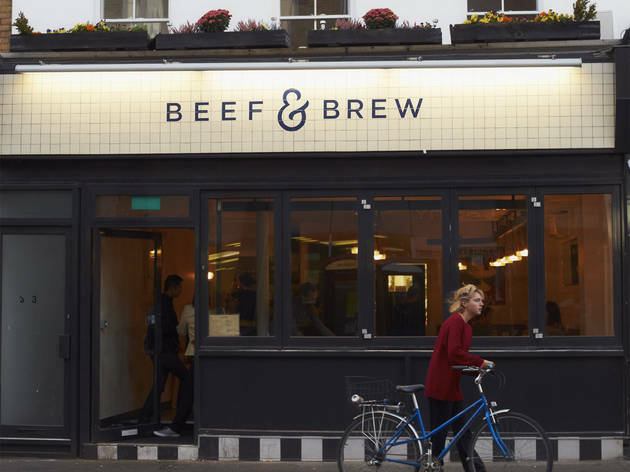 A friend of ours sent us down the road to Beef and Brew, having been herself and enjoyed the food so throughly. As she had forecast, we had to sit at the bar, owing to the number of reservations, but this turned out to be a blessing in disguise as it was pretty comfortable and it guaranteed quick service! We cracked on with a steak and a burger each, alongside chunky fries, gnocchi in cheese sauce and chargrilled broccoli, washed down with a carafe of Malbec. Everything was delicious. The burger, in particular, loaded up with choice Béarnaise sauce as it was, was to die for. The chips were perfect: chunky and big, soft on the inside and crispy on the outside. They came with Tommy K and aïoli, the latter of which was particularly yummy. By this stage the tables that were 'reserved' had still not filled out (it was still pretty early) - we wondered whether this was some kind of clever marketing ploy! We found room for the apple crumble and the chocolate miner's brownie and ice cream, both were as good as what had gone before. The food wasn't cheap, we paid over 30 quid each, but it was exquisite. Definitely recommended. Best £10 steak in London! Great Beers as well. The food here took my breath away the first time I came. 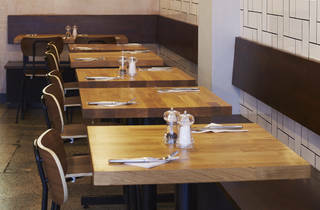 Small but consistently excellent menu, relaxed environment, great drinks and knowledgeable friendly staff. We went last night not expecting much from the 3 star Time Out review. But the meal was absolutely delicious - of the best we've had for ages. My steak was perfectly cooked (I had the Hangar medium rare) and all the sides were spot on. 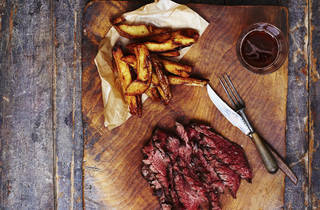 The chips are better than The Hawksmoor and that's saying something! 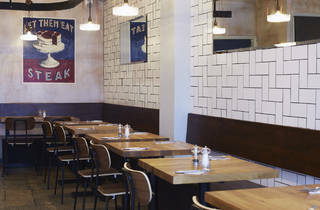 Try the jalapeño gnocchi or the French dip if you want tasty comfort food. Even though we were full we had to try the desserts which were fabulously sticky and sweet. We will definitely be back very soon. A great spot! Lovely food with the nicest owner. 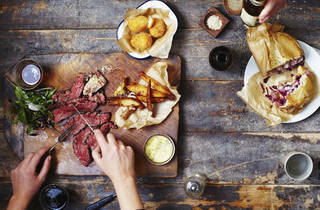 Great steaks and the cauliflower cheese croquettes are a work of art! A group of us ate at Beef & Brew last night. The service was fast, friendly and attentive. I had a chateau steak rare, and it was cooked (or rather mostly uncooked) perfectly. I also had a taste of the pigs cheeks on toast (absolutely lovely, I wish I could have that for breakfast every day) and the salt beef, which isn't something I would personally at a restaurant as its usually too salty and fatty for me to enjoy; having tasted it though I may well order it next time, it was lovely and tender with a great flavour. I personally love broccoli cooked the way it was and like the crunchy stems, such a preferable way to cook it than soggy over boiled florets you get in a lot of places. Also tried some of the gnocchi and cheese which was amazing - definitely a sharing dish though. Really tasty Beavertown IPA and some nice Malbec. There wasn't one thing I tried that I would have been pleased to have ordered. Its such a breath of fresh air to eat great food in an unpretentious and friendly restaurant like this, I am already planning my next trip! Visited here with a group of friends last week and was very pleased (and full!) Despite the slow service, it was worth the wait for the excellently cooked rump steak and delicious polenta chunks. Alcohol is pretty cheap, which is rare for a restaurant, as was the food which was very very reasonable. We need more places like this in London! Visited this restaurant last night and had a fantastic meal. I chose the Rump Steak, medium rare, whilst my partner went for the Hanger. Both cooked to perfection, we also wanted to try each of the sides: chargrilled broccoli with garlic, cheesy gnocchi with chilli, and the best dressed salad I have ever had. We topped it all off a salt caramel brownie and left totally satisfied. 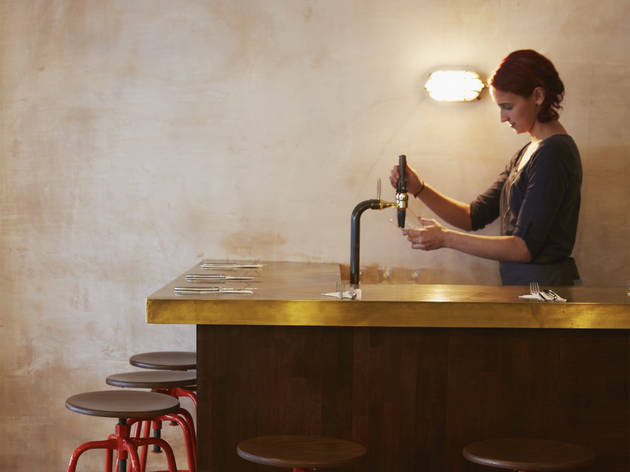 I wouldn't hesitate to return to this deceptively charming and friendly-staffed restaurant, which is a welcome addition to an ever-growing roster on the Kentish Town food scene. We popped into Beef and Brew for some light nibbles before going to a gig and had a very rocky sort of a visit. Firstly,we were greeted by a very snooty waiter who was quite rude to us and ushered us to a table that was by the kitchen- which was no problem except for the waiters face upon offering it to us. We didn't have time to have a full meal and wanted to just order some nibbles,which again seemed to be a bone of contention for the waiter,who seemed to be treating us as if we couldn't afford to eat there or something...we just didn't want a big meal. Although the restaurant seems like a nice place,I got an air of snootiness and also self absorbency. We ordered the pigs cheek on toast,sausage rolls,olives and gnocchi. It took ages to arrive and it was really disappointing- the pigs cheek came as a cold dish (which was not stated on the menu) and also with hardly any toast. The sausage rolls were average and not worth what they charged for them and the gnocchi...this I was most angry at.....the gnocchi arrived cold and hard! I then complained and it went off to the kitchen for a bit and came back,obviously microwaved,and still hard and cold in part. I was shocked and also the attitude of the staff was abysmal. No body apologised or offered an alternative or something complimentary. Just awful. Anyway we didn't pay for that part of the meal but the rest was an overpriced and thoroughly unenjoyable eat. I am sure their steak is very nice but I would rather go somewhere else to get my steak,thank you very much.